What Germans are supposed to know about the Science Forum: insights from the press conference with Joachim von Braun, head of the Centre for development research and Holger Baum, head of 'MediaCompany'. 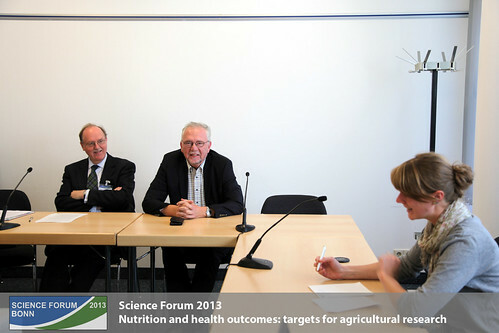 As an opening to the press conference, Joachim von Braun points to the global relevance of the conference's topic and describes the role that nutritional imbalances also have in industrial countries, pointing to non-communicable diseases and hidden hunger. He calls this two issues humanitarian problems and therefore sees a global responsibility to address them. Moreover stunting has tremendous consequences for economic progress in developing countries. In this regard, the role of Germany as well as other industrial countries is to support initiatives such as the multinational SUN movement , putting the affected countries themselves in the driver’s seat. In theory there is enough food to feed the world, but it still does not reach the people in need. What’s more,calorie supply does not automatically equal balanced nutrition, as von Braun argues. In this regard he emphasizes the role of technological progress as biofortification of staples often represents the only channel to reach the poorest of the poorest. However, solutions should be side-specific and not exclusively following either the ecological or the bio-enginieering pathway. Even though awareness on nutrient deficiencies in staple crops exists since 20 years, enriched varieties had only been introduced in the last two years. Reasons for this are the long time the breeding process of a new variety takes, as well as the immense effort to find wild ancestors, still containing the targeted nutrients and reintroducing them. Probably the most upfront reason is that rich people always have the opportunity to supplement their diet with enough vegetables and meat items to reach a balance, and that their poorer peers made it to the public (research) agenda only few years ago. Phenomenons like obese mothers with undernourished children, especially in urban areas, added by the leader of the Centre for development studies (ZEF)in Bonn moreover show the importance of education for healthy nutrition. Agricultural and health sector cooperation seems to be the latest fashion, as for instance the EU health ministers only asked for the support of the agricultural researchers earlier in 2013. Channels on how to facilitate this 'new' approach are discussed on the conference in detail.